The Paddock to Reef Integrated Monitoring, Modelling and Reporting Program (Paddock to Reef program) provides the framework for evaluating and reporting progress towards Reef 2050 Water Quality Improvement Plan (Reef 2050 WQIP) targets through the Great Barrier Reef Report Card. Launched in 2009, the program unites more than 20 industry bodies, government agencies, Natural Resource Management bodies, landholders and research organisations—working together to measure and report on water quality factors that impact Reef health. It is jointly funded by the Australian and Queensland governments, and has continued to improve in terms of scope, methodology and application over the 10-year period of implementation. Monitoring and modelling occurs across a range of attributes, from paddock scale through to sub-catchment, catchment, regional and Great Barrier Reef-wide. 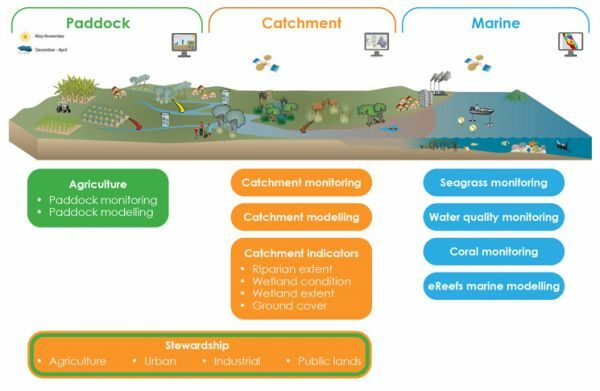 In line with the Reef 2050 WQIP framework, the Paddock to Reef program evaluates management practice adoption and effectiveness, catchment condition, pollutant runoff and marine condition. The program areas are inter-linked and integrated through a common assessment and reporting framework. In the near future, the Paddock to Reef program will be integrated into the Reef 2050 Integrated Monitoring and Reporting Program (RIMReP). The program will provide a comprehensive understanding of how the broader Reef 2050 Plan is progressing and guide future management of the Reef. Stewardship—includes human dimensions & economic aspects. Monitor, interpret and report on water quality status and trends and related ecosystem health in the Great Barrier Reef, and the pressures and drivers of water quality condition from the Great Barrier Reef catchment. Report on the progress towards Reef 2050 Water Quality Improvement Plan targets, objectives and long-term outcome through the delivery of the Great Barrier Reef Report Card. Develop and improve the evidence base that provides the foundation for learning and improvement to support adaptive management for actions within the Reef 2050 Water Quality Improvement Plan. Provide knowledge and insights to enable partners to evaluate, prioritise and continuously improve the efficiency and effectiveness of Reef 2050 Water Quality Improvement Plan delivery and implementation at Great Barrier Reef-wide, regional and catchment scales. Provide the primary mechanism for evaluation of the water quality theme of the Reef 2050 Plan and in conjunction with the regional report cards, the Catchment and Estuaries theme of the Reef Integrated Monitoring and Reporting Program. More information about the program can be found in the Paddock to Reef design (PDF, 8.1MB) .